If you've purchased a Kindle Fire as a gift, and want to set it up before the official unwrapping, I have a few tips for you. These are just for consideration, not necessarily recommendations. Peruse and see if anything seems interesting to you. Wouldn't it be terrific for the recipient to already have a few well-chosen books and maybe a dozen songs when they first power up? You can do this, but there are a couple of considerations. 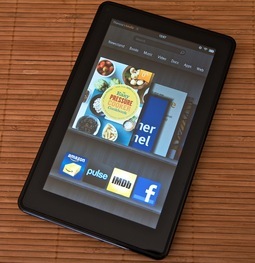 First, the Kindle Fire is tied to the account you establish when you set it up. It's easy enough to change accounts, but by doing so, you also lose any content you've purchased. (You don't really lose it; it's just not on that particular Kindle anymore.) So it's best to set up the Kindle with an Amazon account that belongs to its eventual owner. You could get the eventual owner's information, but then when you purchase stuff, they will be charged. Ho Ho Ho! Another route to consider is setting up a new Amazon account in the eventual owner's name. I did this with a shared email address we have with our cable company. She never checks that email, so it was perfect for this use. I wrote her log-in information on the instruction card that came with the device. If you don't think that preloading content is a practical idea, you can get an Amazon downloadable gift card and include it with the Kindle Fire. You choose the amount, pick the style of card, then Amazon sends you a PDF that you can print out and fold. It's personalized, looks great, and is a nice touch to the already thoughtful Fire. Since the device doesn't come with a case, you may want to purchase one. This makes a great add-on gift that others can give. You provide the Fire, they add the steak sauce. If you spend an hour or so getting familiar with the Kindle Fire, then you can help the recipient get up to speed quickly after the unwrapping. Plus, there might be software updates that need to be installed. Why not take care of that beforehand? The Kindle Fire ships with a decently charged battery. But you can top it off and have the device ready for a full day of action. Once you give the gift, let her enjoy it. It's not your toy. Hands off unless she offers to let you play with it. 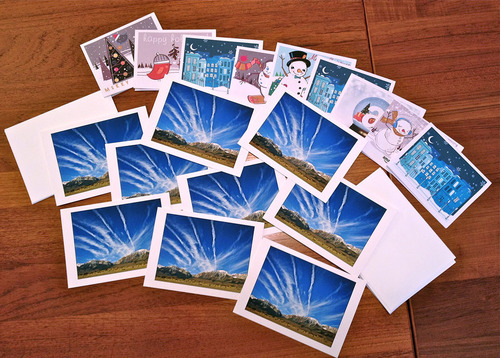 Accessible time lapse photography is a gift of the digital age. 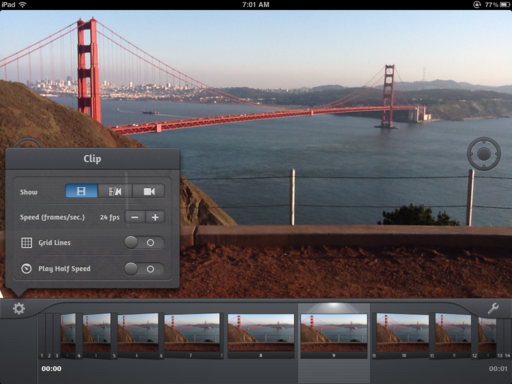 And now, thanks to Boinx Software, it's easier than ever to create stop motion and time lapse video with just an iPad 2. I've been testing the beta version of iStopMotion for iPad ($4.99 in the App Store), and I can tell you right now... it's a blast. 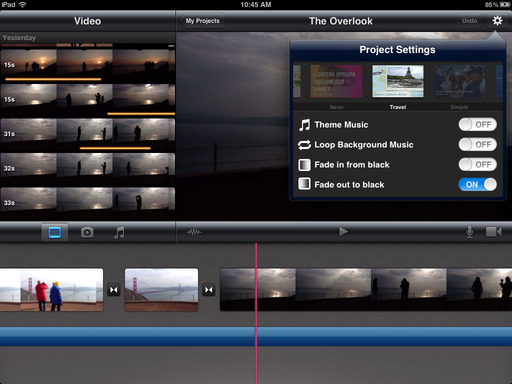 "The Overlook" - recorded with the camera on an iPad 2 with iStopMotion, then finishing touches added in iMovie for iOS. No additional cameras or computers used. By Derrick Story. 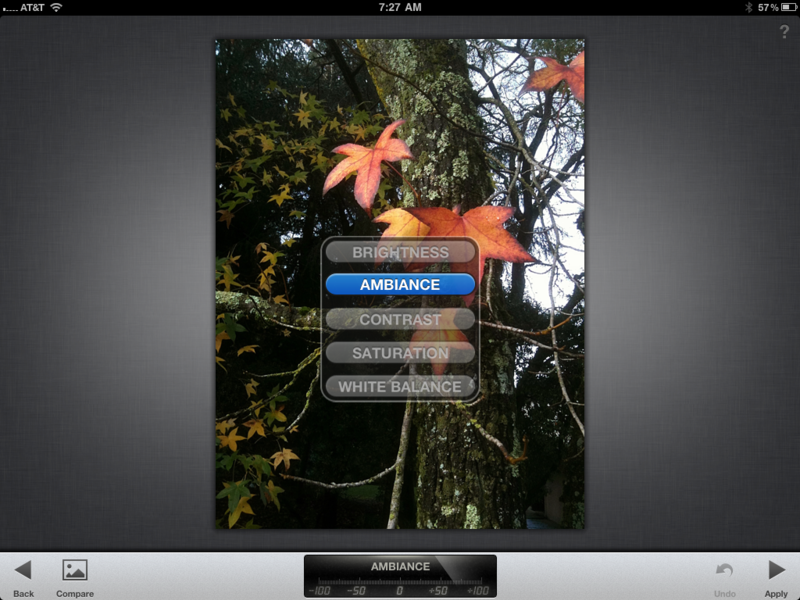 To test the nimbleosity of this app, I set out to record, edit, and publish a time lapse movie using just the iPad 2. I put the iPad in a studio clamp with rubber protectors, then mounted it on a Joby Gorillapod Focus with Ball Head X and launched iStopMotion. 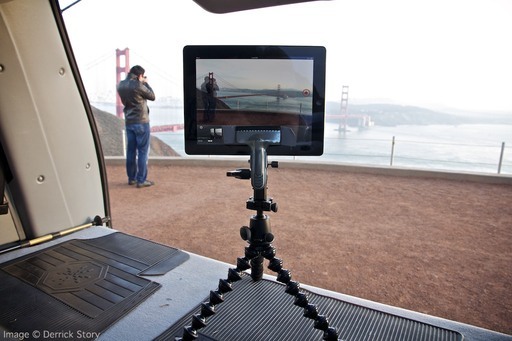 iPad 2 rig for recording "The Overlook." The excellent battery life for the iPad, and iStopMotion's judicial use of it, allowed me to record over the course of an entire afternoon, into twilight, without having to recharge. 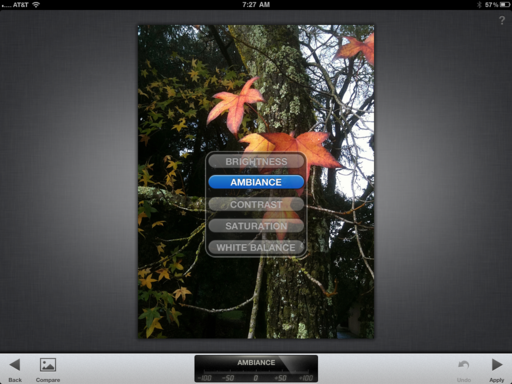 You have three shooting options with the software: front iPad camera, back camera, or via WiFi with the iPhone 4S (using the free companion app, iStopCamera.) I used the back camera for recording "The Overlook," but also tested the iPhone 4S camera via WiFi for making this stop motion movie. I typically shot one frame every 3 seconds when using just the iPad 2, or switched to one frame every 6 seconds when using the iPhone 4S on WiFi. You have control with the duration using this software. 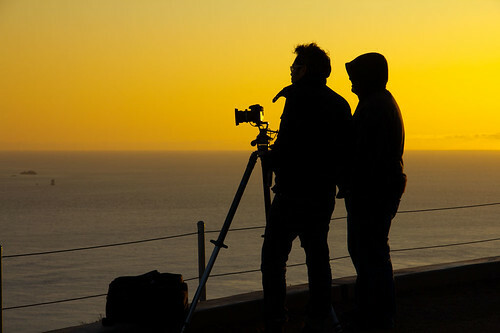 Once you've recorded your images, you can play them back at a variety of frame rates. I typically watched the movies at 12, 15, 24, or 30 fps. If you notice a few images you don't want in there, they can be deleted individually by tapping on the wrench icon. Other helpful features include onion skinning, exposure setting, and grid lines. Once you have the movie to your liking, you can add a soundtrack from your music library and upload it to your Camera Roll, YouTube account, or share via email. 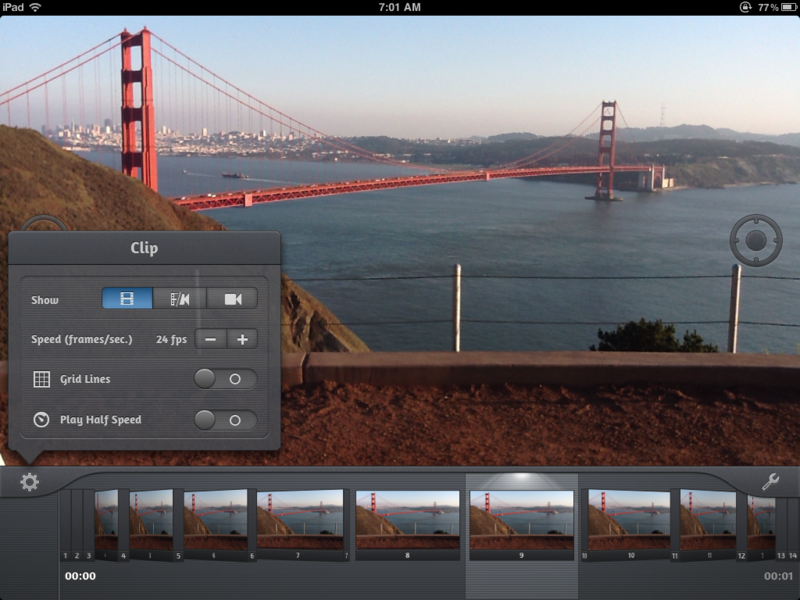 There are three resolution options for export, including HD. For "The Overlook," I saved scenes to my Camera Roll, then opened them in iMovie for iOS to stitch them together and add the finishing touches. I'm going to discuss this process more in next week's TDS Podcast. iStopMotion for iPad earns a Nimbleosity Rating of 4. That's impressive considering this is the first release of this ambitious app, and we should see further enhancements up the road. Used by itself, you can create simple, but impressive stop motion or time-lapse movies, enhanced by the ability to delete frames and control frame rate. When used in combination with iMovie for iOS, iStopMotion becomes even more powerful. You have an entire recording, editing, and publishing environment, right there on your iPad. When we're very busy (as most are this time of year), it can be difficult to adhere to your formal archiving plan. Even I struggle at times with this (it's true!). But I do have a Plan B in force that keeps me protected. I call it the "Mini 2-Drive Approach with Color Labels." I keep one WD My Passport 750 GB portable hard drive in my backpack and another at the studio. After I upload a shoot to an Aperture library on my MacBook Air (but before I erase the memory card), I copy that project to both external hard drives. It only takes a few minutes. Now I have my photos, plus any work I've done to them, in at least two different places. But here's the real trick: keeping track of the "workflow state" of each library. When looking in the Pictures folder on my MacBook Air, I might forget what I've done, or not done, to each library in there. Has a library been backed up on external drives? Has it been incorporated into my main Aperture library? How do I know? I use color labels to keep track of these libraries. A yellow color label means the library has been backed up, but not incorporated into my main Aperture system. A blue color label means it's been incorporated into the main Aperture library on my desktop computer. 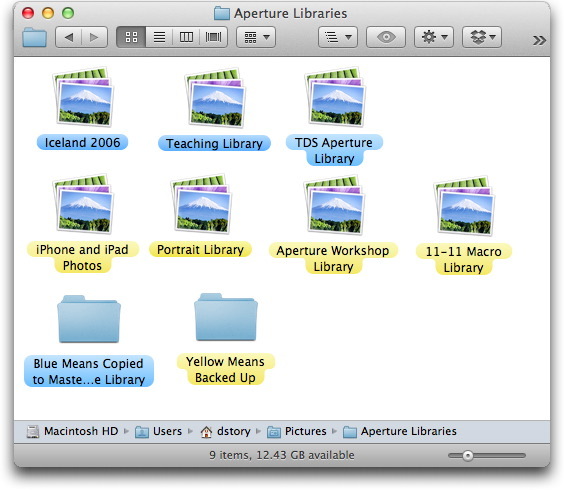 And so I don't forget what's what, I create two empty folders titled "Blue Means Copied to Master Aperture Library" and "Yellow Means Backed Up." That way, I always immediately know the state of any given library on any device. As for creating the master system itself, take a look at Organizing and Archiving Digital Photos for some new ideas. If you start building your plan now, you should be ready to implement it on Jan. 1, 2012. And if you want to learn more about Aperture itself, such as how to merge libraries as I do here, I have a few titles on lynda.com for that too. I like to set the Drive Mode to "continuous" when shooting animals, children, and people in general. Yes, you take up a bit more space on your memory card. But you also increase the odds of getting the best pose possible. Once you have your favorite shot, you can delete the others if you wish. To replay the above sequence, I've had the best luck by refreshing the web page. All you have to do is find Drive Mode on your camera. It's usually represented by clock-like symbol (representing self timer) or a series of squares that illustrate a sequence. In the menu, choose the series of squares. Then start shooting. This setting is particularly good for natural light portraits. 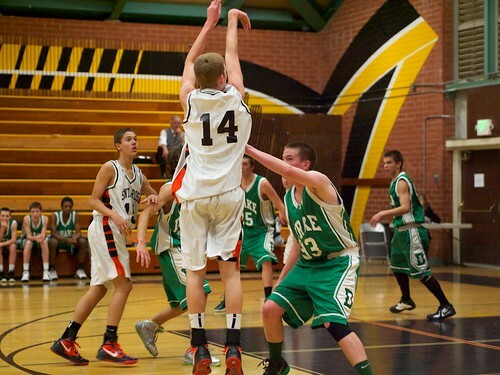 I packed the new Olympus 45mm f/1.8 prime lens for a high school basketball game to see if could keep up with the action. The glass was mounted on an Olympus PEN Mini using the VF-2 Electronic Viewfinder instead of the LCD to compose the shots. Jump shot captured the the Olympus PEN Mini and 45mm f/1.8 prime lens. Photo by Derrick Story. 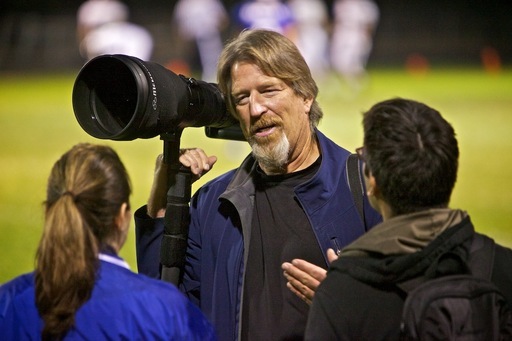 At first, you might think this is an odd rig for action photography. I can tell you, it's actually quite impressive. The focusing is blazing fast with this camera/lens combination -- and by any standard, not just within the world of compact system cameras. Plus, I had 5 fps for burst mode. And to be honest, it felt faster than that. I set the ISO to 1600 and shot wide open or at f/2 for the entire game, and the resulting images were crisp and clean. You can see a gallery of 10 shots here to give you a better feel for this lens in action. I had read user reviews of this lens, and everyone said that "you would not regret this purchase." Very seldom that you see such wide agreement about optics. But I'm adding my voice to the chorus. 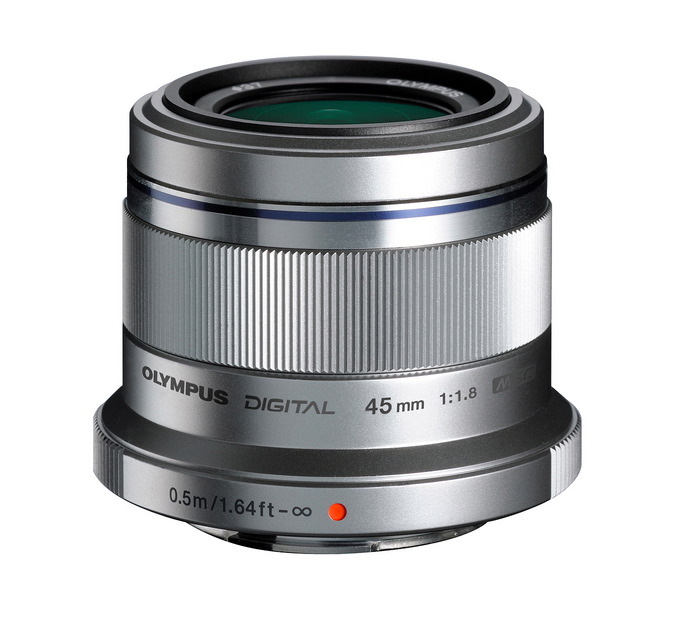 The $399 Olympus 45mm f/1.8 prime is now my favorite Micro Four Thirds lens. Fast, sharp, and affordable. I was working on a project last night at the Golden Gate Bridge north of San Francisco, when I noticed these two photographers in the distance. I always keep a second camera on-hand for unexpected shots. Fortunately, I captured these two before they changed position. I have two goals on every photo shoot: 1) Make sure I capture what is expected for the assignment, and 2) Be ready for the unexpected. Only when I have good images in both categories do I consider it a good shoot.